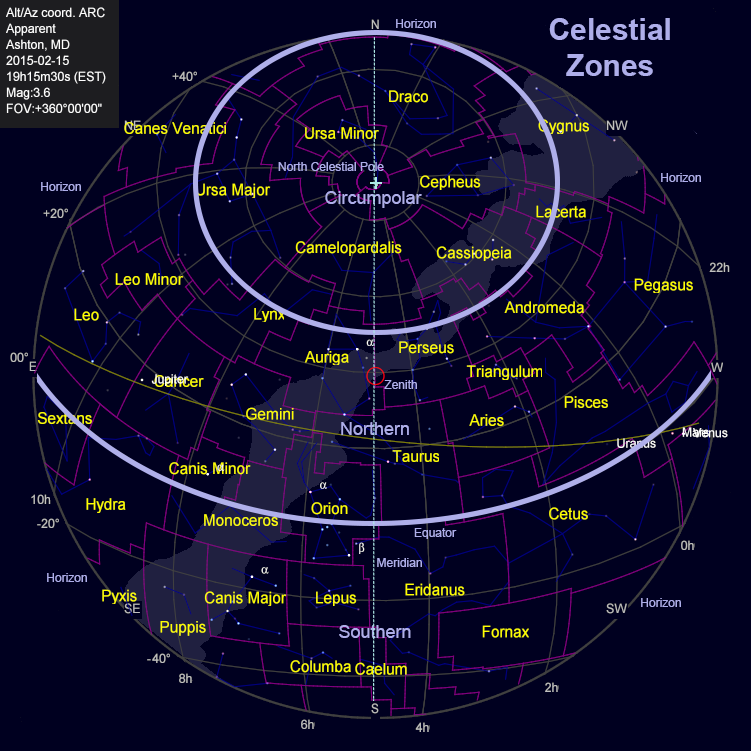 Northern Constellations are those that fall within the Northern zone of the celestial sphere, which is zone that spans from east to west across the central area of the sky chart below. This zone is bounded on the north by the circle that defines the Circumpolar region, and on the south by the equator, or 0° declination, that spans from the east to west points on the horizon. Stars in this zone generally rise in the east, pass directly or nearly directly overhead, and then set in the west. These are the most easily observed constellations when they are on the meridian, because views in this region are the least affected by the atmospheric haze that degrades views near the horizon. This region is also the least likely to be blocked by obstructions such as trees or buildings on the horizon.